I’ve decided to make a central area for some hints and tips we’ve picked up on our journey through CM9798. On this page you’ll find top players, the best formations and some other tips. We trialled some formations in the summer of 2017, my absolute favourite was the 2-3-1-2-2 which I use in the Aberdeen save. You’ll notice the constant in a lot of these formations is playing with a direct style, which is also the case in the 4-2-3-1 which was also very good. We had unprecedented success using a narrow 4-4-2 diamond with Aston Villa but to date that seems like a fluke. 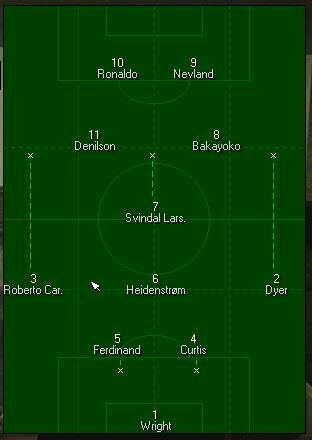 If you want to keep it simple, my go to formation is always 5-3-2, it’s probably the most balanced formation and was in style at the time the game was released. Your midfielder in the centre of the three will have a small forward run, if you’re using the formations as listed on the tactics screen, and my advice for that player is that you have somebody with good heading. I have no idea why but it works. John Curtis (CB, £2m) – Starts in Man Utd’s youth team but can never get a game. You’ll possibly be able to loan him in season one and buy him shortly thereafter. Depending on his contract he may be much cheaper than £2m but he will go on to captain England. Bjorn Heidenstrom (CB/CM, £50k) – Friend of the blog Bjorn Heidenstrom starts at Leyton Orient and his value will fluctuate depending on his contract situation, but you can usually pick him cheaply in the first season. He’s a must have if you’re in the lower leagues but will also do a job at a higher level. Takes a mean penalty. Erik Nevland (CF, £1m) – Goal machine! Basically any of Man Utd’s youth players are worth snapping up. Nevland will be available after season one. Andrew Duncan (CB, Free) – Discarded by Man Utd in the off season, Duncan is a promising centre half who can be picked up for free. Definitely one for the lower leagues but can certainly improve. Anthony Betterton (GK, Free) – A freebie keeper who will do a good job for you, again in the lower leagues though. Andrew Mainwaring (CF, £5k) – Plays for ‘Non-League’ and can be signed for £5k. Will improve with game time and did a decent job for me at Barnsley in the Premier League once, so provided you aren’t a European giant you don’t need to panic (sorry). Graeme Tomlinson (CF, Free) – Another discarded by Man Utd and available for free. Sign him, play him, enjoy him. Similar to Mainwaring, certainly one for the lower leagues and will do a job in the higher tiers. Tommy Svindal Larsen (CM, £500k) – I think he was dumbed down a bit in the patch but this has been unproven. Cult hero, icon. Can also play out on the left, if you are Souness. See Also: Dida (GK), Evar Moas (CB), Kieron Dyer (D/M RL), Marcus Purk (CF), Phil Mulryne (AM LC), Martin Lauchlan (DM LC), Alex Martin (CF), Billy MacDonald (DMC), John Ritchie (CF), Robert Dunn (M/FC), Neil Alexander (GK), everybody’s favourite Icelandic re-gen (DM/FC – wait one season, let the real one retire then pounce). Big Club Release – We’ve all fallen victim to the big club release clause, but you can get past it by listing your players with the clause for loan. You’ll have to do this straight away or the board will veto it once they become important. Might not work forever but you’ll end up with well over the asking price rather than the tribunal fee. Re-gens – Find an old player and bid for them on July 15th before the game updates. If the player retires, your bid will carry over to the re-gen. Some re-gens are easier to find than others, best way to do that is to look at young players in a certain position of a certain nationality. For example, the likes of Chilavert’s re-gen will be easy to find as there aren’t loads of young Paraguayan goalkeepers, or Luis Enrique’s because there won’t be many outfield players who can play every outfield position. Players on your shortlist never retire. [15/6/2015] Click here for the striking options – You voted Ronaldo (25%) and Ibrahima Bakayoko (22%) as your front two. [1/6/2015] Click here to have a look at the central midfielders – You picked Zinedine Zidane (24%) and Bjorn Heidenstrom (15%) as your midfield pairing. [18/5/2015] Click here for right sided midfielder options – 38% of you chose Luis Figo. Have you considered revisiting this topic and having an new vote? Hi Dave, I love your blog and it has inspired me to play cm9798 again. I’m not sure if this is a hint or tip but something interesting I found while managing Sporting Lisbon in portugal. First there is no limit of forign players in the Portuguese league but what is even better is when you play in the champions league Brazilian players aren’t considered forign when playing for a Portuguese team. I’m currently using to try and make my sporting Lisbon team and unstoppable European force filled with Brazilian internationals and maybe the odd Portuguese one too. Finally I’m using the 2-3-1-2-2 which I think is amazing. I’m wondering what you all think of the ‘tactical wall’ – fact or fiction? (The idea that the game figures your tactics out and suddenly you can’t buy a win). I’m in season 3 with Lincoln, was sitting pretty at the top of div 1 in January, only lost once in the league, then the wheels came off. A run of 8 defeats in 10 games has put me 12th!!! I’ve had no mad injuries, the only thing I can think of is I bought a youngster from Swansea; he had a ‘big club’ clause and wasn’t happy in div3, perhaps his low morale has tipped the balance in my squad and upset everyone!?? Don’t change, their positions remain the same. Thanks for the reply Chris. This opens up a whole new dimension to the game. Sadly just lost a saved one which had got up to 05/06 season but it’s totally vanished now. Starting a new one now. Gutted. 1) how to make the players morale up ?? 2) sometimes when have international games all my team go and i don’t have players to play in the cup or league what to do ?? Always a common phrase when my brother and I are going head to head on this…as we have done for 21 years! A phenomenon which occurs frequently when you have multiple players in your squad capable of leading the team on the field. How do you choose the right one?? We’ve ended up selling all other high influence players off in order to stop the run of terrible results, which seems to happen without warning!